PJ, 16 June: It's been a year since the US Department of Justice made that explosive lawsuit announcement involving 1MDB. Since then, the Americans have elected a new President, Dr Mahathir Mohamad has confirmed his desire to be Prime Minister of Malaysia once again, and the DOJ's lawsuit hasn't moved an inch. The department's latest "action" has similar elements and juicy bits that featured in its "action" of last July's. So why aren't Malaysians not debating it like they did last July? I belong to several dozens of WhatsApp groups but only one is discussing the DOJ's action and by "discussing" I mean one individual has been providing all the links to DOJ news that might be spun against PM Najib Razak. Does that mean we are immune to news involving alleged corruption and stealing of billions from our coffers? Or are Malaysians generally not buying what the DOJ's claiming, especially since nothing has come out of their last action? This time around, what's different is the response by the Malaysian authorities. The Attorney-General Chamber was lightning quick with his response Nothing new, no evidence, Apandi dismisses DOJ's latest suit. The Prime Minister's Office has also slammed DOJ's unproven allegations and suggested that there may be ulterior motives involved. Even Jho Lo is challenging the DOJ to prove its claims in the court of law! WSJ reporter, in sharing a tweet said to be from Jho Low, says it is the first statement in over 2 years by the Malaysian financier who, US authorities allege, is the central figure in the scandal involving 1MDB. PETALING JAYA: Penang-born tycoon Low Taek Jho has reportedly responded to the US Justice Department’s (DoJ) move to seize another US$540 million in assets purportedly stolen from 1MDB and used to fund extravagant spending. 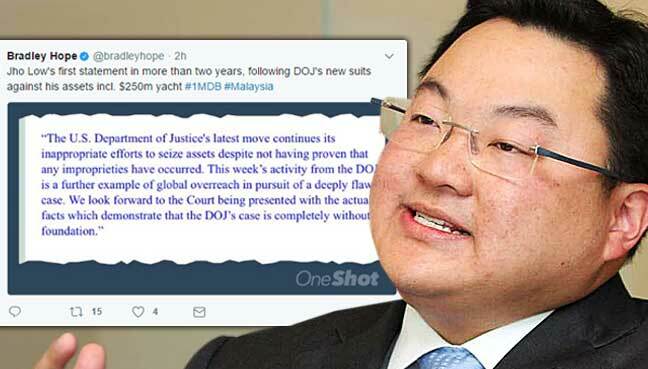 In a tweet attributed to Low and shared by Wall Street Journal reporter Bradley Hope, the tycoon, popularly known as Jho Low, reportedly slammed the DoJ, saying it had not proven that any improprieties had occurred. “The US Department of Justice’s latest move continues its inappropriate efforts to seize assets despite not having proven that any improprieties have occurred. “This week’s activity from the DoJ is a further example of global overreach in pursuit of a deeply flawed case. “We look forward to the court being presented with the actual facts which demonstrate that the DoJ’s case is completely without foundation,” the tweet read. Hope, who shared the tweet today, said it was Low’s first statement in over two years. “Jho Low’s first statement in more than two years, following DoJ’s new suits against his assets incl. $250m yacht #1MDB #Malaysia,” he said on his Twitter account. Low has, in the past, denied any wrongdoing. The DoJ’s latest move follows court cases launched last year in which Washington sought to confiscate more than US$1 billion allegedly embezzled by businessmen with political connections in Malaysia, bringing the total amount US officials say was stolen to US$4.5 billion. The items cited in the new suit as subject to seizure include a Park Avenue condominium, diamond jewellery, shares of fitness club operator Fly Wheel Sports Inc, a painting by Pablo Picasso titled “Nature Morte au Crane de Taureau” and rights to the 2014 film “Dumb and Dumber To”. The government also wants to seize a luxury yacht, the Equanimity. Attorney-General Mohamed Apandi Ali dismissed the suit, saying the DoJ had yet to provide any evidence of misappropriated funds from 1MDB. The Prime Minister’s Office (PMO), meanwhile, suggested that the allegations were aimed at smearing certain individuals and had arisen from input by political opponents. A CRIME WITHOUT A VICTIM? The 1MDB issued a statement that basically says it is not a party to the DOJ's latest civil suit. Read 1MDB; No contact made by the US DOJ. The irony is this: it was the DOJ that made out 1MDB as the victim of the crime that has formed the basic of its lawsuit in July last year and the latest one. To me... the first thing Apandi or Najib need to do... if they really wanted to show that nothing was wrong in 1MDB is to declassified all reports that have been OSAed. Few points to bear in mind so as to enlighten your readers as well as to put things in perspective. The DOJ lawsuit is a civil - not criminal - one. The pace of all civil suits in America is glacial, meaning, it is normal for it to take years before coming to trial. For another, the suit is againts the ASSETS, not inviduals. Of course those assets belong to someone, so indirectly it is a suit against their owners. However if there is a criminal indictment initiated during the process, then the pace would hasten quickly as there is the axiom in law that justice delayed is justice denied. The only reason DOJ can "campor tangan" in the matter is because those funds to buy those assets flowed through American banks. Even if Low and Aziz and MO1 could smuggle all those millions in their suitcases and diplomatic puches through the airport, they could still get into trouble. In America, all cash transactions exceeding $10,000 must be reported to the authorities. So you cannot escape. The central crux of the matter is this: Where did all the money to acquire those properties come from? In case of Jho Low one could concieveably believe it was family's wealth through years of hard work by his ancestors, as he claimed. For Reza Aziz? Wealth from his father? A nondescript Malaysian army officer? Stepfather Najib, who had been government all his adult life? Mother Rosmah is the daugheter of a village school teacher from my kampung in NS. Look at the house where she was born! No weatlh to speak of. However if you believe that some Sheik in Saudi Araba was generous to give Reza hundreds of millions for no apparent reason, as he claimed, then there is some mangrove swamps in Lumut I can sell you. That my friend is the crux of the problem. Until someone can give a better explanation, I believe the DOJ version. Everything else is spin. Tidak pernah dalam sejarah kita bertindak sebacul ini. Dah lah kita dituduh bermacam-macam, kita hanya mampu berkata-kata tanpa tindakan mempertahankankan maruah. Tidak kita saman mereka. Tidak hantar nota bantahan kepada mereka. Malah tindakan paling asas iaitu memanggil Duta mereka dan melahirkan perasaan dukacita kita bila kepimpinan kita dihina oleh Jabatan Undang-Undang mereka secara fitnah. Yang mempersenda serta menghina kepimpinanan bukannya orang perseorangan mereka. Yang menghina kita adalah jabatan kerajaan mereka. Atau sememangnya kita sudah menjadi sebacul ini; dan hanya mengharapkan teman sebacul kita berkata-kata mempertahankan benang basah yang sudah reput? A photograph entitled “Boy with the Toy Hand Grenade” by Diane Arbus. I wish you will post my comments. 1. If they have nothing to hide, Why don't Jho low allow himself to be questioned by cops here and elswhere? 2. Have you read the report? Ramadhan month , don't lie. 3. Why don't MO1 and Wife sue DOJ? Serious allegations been made. Need to clean oneself. morning rd...u ada kucing tak? ?